This is the day…….that the LORD has made! As I come out of my sleep this morning, the first thing that comes to my mind is the words of King David “This is the day the LORD has made, let us rejoice and be glad in it”. Before you think I am so spiritual, it has been almost a year since that has happened. I often wake thinking of some nice woman I was dreaming about or generally some issue about life or ……. I rolled over and mentioned it to Kathy and she said “that’s interesting because in her daily Bible reading guide for August 1st, the author also uses that verse Psm 118 v24. 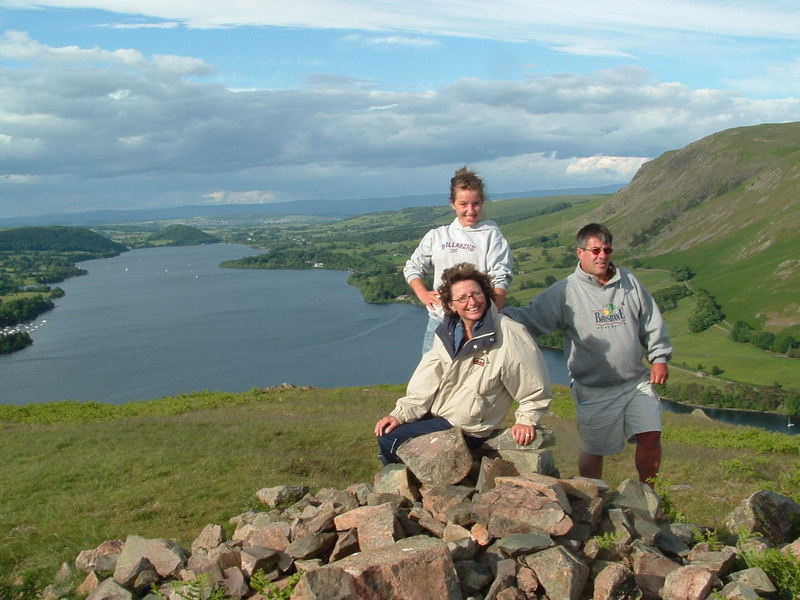 When the kids were young we enjoyed walking up a hill at the bottom end of Ulswater, the northern lake of the Lake District. For some reason we nicknamed it “God’s Loft” (attic). Over the years it became a favorite spot, even to the point on one of my birthdays we took our friends Dave and Linda there and sat and opened a bottle of bubbly to celebrate. When Mike died on August 1st 2009, Akila was on the M. V. Logos Hope in the Caribbean. In 2010 Laura was in Germany and in 2011 both of them were in Germany so I just went to work. This year is the first year we are all together. I had been back and forth in what we should do and suggested we go and climb “God’s loft”, in the morning, have lunch at Pooley Bridge and head out for a nice meal tonight. I haven’t told them but I plan to have a very nice bottle of bubbly with us. It’s grey and drizzle outside, just like it was “raining on the roof” this time in previous years, but we will do it anyway. I had already decided that whilst we want to remember Mike on this day, I want to celebrate the life of my girls, not be sad over the death of my boy. In fact I want to celebrate his life and remember the good times we had with him at “God’s loft”. I enjoy the Message version of PSM 118 and he says “This is the very day God acted— let’s celebrate and be festive!” As though I need any encouragement! God did not have a bad day 3 years ago. Moses said “what man intended for evil, God intended for good”. That is one of the Mysteries to me and an argument of some who do not share my belief, “yes I understand the evil of man, but I do not understand why a loving God does not over-ride man”. For me God acted that day and He took my buddy to the place I wanted him to go, just not on the same time scale! And so in the process there is pain, but the end product is awesome. So today we are going to celebrate and be festive because we want to remember this is the very day God acted and promoted Mike. It’s also a great day whether its raining or not because I have all three of my girls with me. In fact I think a cigar may accompany the bubbly! This entry was posted on Wednesday, August 1st, 2012 at 6:54 am and is filed under Uncategorized. You can follow any responses to this entry through the RSS 2.0 feed. You can leave a response, or trackback from your own site. One Response to This is the day…….that the LORD has made! I’ve just read your words with tears in my eyes,thank you for helping me to see the death of my beloved Nick in a different way.